In need of help from the refugee from the East of Ukraine! In the fight against the disease - the main thing is to gain time and make the correct diagnosis. 29-year-old Ekaterina Reunova, mother of 2-year-old Stefan, and IDPS from Gorlovka (East of Ukraine) are now hostage to the disease and limitations of the Slavyansk Provincial Hospital. February 7, she lost consciousness. This syncope was secondary - a month ago Katya had the first attack. In December, she made a tomography - the doctors said that everything was normal. During the month, periodically, she experienced severe headaches. The other day, returning home, Catherine fainted for the second time in the elevator, where her mother-in-law found her unconscious. “Fortunately, Katya, approaching the porch, called me and said: open, I enter,” said Tatyana Vladislavovna, Katie’s mother-in-law, “I opened the door and waited for her from the elevator, then I heard the sound of a fall, I thought it was some kind of the alcoholic fell down, then the elevator door opened and Katya dropped out of it ... we were terribly frightened and called an ambulance " On February 8 in Kramatorsk the girl had an MRI scan of the brain. All this time, Catherine is in a recumbent fettered position because of the inability to even move her head due to severe pain. She was diagnosed with MR-signs of subarchal hemorrhage in the frontal and parietal areas, aneurysm of the subclinoidal part of the right, internal carotid artery, a single focus in the right frontal lobe of a vascular nature. Recommended: consultation of a neurosurgeon, a neuropathologist at the Institute of Neurosurgery in Kiva. Today, the girl needs to be transported to Kiev for further examination and treatment at the Institute of Neurosurgery. Katya and her husband and child rent an apartment in Slavyansk - only the rent leaves most of their budget. The fate of immigrants in foreign cities is not easy. Katisanitized_by_modx& #39s illness is a big shock for everyone and unfortunately, no one was financially ready for this. For the first time you need at least 9,000 hryvnia. The Reunov family agreed to become the heroes of this story in order to tell about how important it is to make an accurate diagnosis in time for successful treatment. If you join and donate any amount, Kate will be diagnosed faster to give the girl a chance to beat the disease and live a long happy life. We want precious time not to be missed, because a young son is waiting for a young mother at home. PS Follow the news to know the exact appointment of a neurosurgeon and further developments. Katya is already being taken to Kiev by ambulance specialist. You can donate to the card 4149-4991-0779-8330 Reunov Denis (Katya’s husband). If you share it on social networks, the process will go faster. Thank!!! We arrived from Lugansk in 2014. We left a newly purchased 3-room flat. My husband left his business and together with three children and two bags full of childrens clothes and diapers (the youngest was only 9 months old), we went to Cherkasy. We were unbelievers and never went to church. We liked Cherkasy, and in the Hospitality Center for Refugees, Valentina Grigas introduced us to Rudenko Andrey. He invited us to the church and to his group. In 2015, my husband and I repented and on July 4th we received water baptism. We (8 people) live in three rooms of half a house, which is under sale, and before that we moved 6 times, lived in the village, but there was not even water, school and work ... Now we live in a house, but it was not repaired for more than 20 years - the owners went to America. Utility payments in winter consist 5-6 thousand hrivnas. The windows are filled with oilcloth and the main thing is that we can be in the street with small children at any moment again. Therefore, we began to look for permanent dwelling. In the city everything is very expensive, my husband and I work getting small salaries and cannot even pay huge utility bills. In July, Andreys mother was diagnosed with cancer, grade 4; everything we had accumulated went into diagnosis and the start of treatment. She is now undergoing the second chemotherapy. We pray to find a permanent place of residence. We found a house not far from the town in the village, but the train and the bus go there and it will give us the opportunity to go to the town for work and to the church, where my husband and I serve. The house costs 6000 dollars. This is a very high amount for our family! We have only 120 dollars now, but we have to exchange them for utility payments in the near future. Bank card number in Ukraine: 4149 4978 4877 5450; Sergienko Galina Viktorovna; my number in Ukraine (on Viber) 095-670-27-07 Western Union or MoneyGramm Thanks for all your support and help! God bless you! If someone knows anybody from Lviv that can give an apartment to a family with 3 children, please let me know. The family is very close to me and they are very good christian people. At the moment the are renting an apartment in Lviv, but for them is very difficult to pay for rent and there are very little chances that they could save money to buy a place on their own. May God bless you! Hello everybody! If you just googled, "How to Get a Free Bible Without Stealing One From a Hotel Room," you are on the right track. There is a way to get it free. Typically, the United States Bible Society promises to send a Bible to anyone who wants one. A simple request will do. The society website provides a form for making requests. Fulfillment takes about 30 days. For the most part, the United States Bible Society offers complete King James Version Bibles only. God is good! He miraculously gives us more of what we ask for, or can only dream of, if we believe as children. A miracle happened in the life of one little girl from Donbass! The Lord fulfilled all her desires in one month. Charity organization offered her to participate in the “Family to Family” program. We needed to collect all the documents very quickly, but miraculously God gave us everything and covered all the expenses. My husband and I have seen Him leading us. I am sure this Christmas will remain in the memory of my daughter Maria for a long time. Big thanks to Olga and Vitalii for that they have become close friends to Masha and the whole our family, for the warmth and care she was surrounded with all the time of her stay in their family. After the trip, my daughter said: "I was like I’ve visited the world of my dream". I would like to bless the people who organized this Christmas miracle! May there be more such miracles in their lives! I want to express my gratitude to the team of the program "Family to Family", because my child had the opportunity to see the world, make new friends and forget about the horrors of war!!! I am mother of Zlata Spitsina, the child who has had a wonderful New Year holidays. My heart is full of joy that I want to share with you. On December 17, my daughter came to America for social rehabilitation to the families, who accepted children from our country as their relatives. I had a lot of worries, but after her first call, I realized that every day spent with this family was fabulous, filled with bright colors. Happiness overwhelmed her! My daughter has spent a month in America, has seen the ocean and get acquainted with a wonderful family. I will never forget this time, because every day I received a lot of good emotions from her, she became different: calm, mature, joyful and happy. On the way back home, she told about the water park, the aquarium, horse ride, shopping, trip to the ocean and other. She showed beautiful clothes, shoes, played with new toys. She also has brought gifts for us. It was very important for her. She filled her wardrobe with clothes that uncle Sasha and aunt Vera bought for her. I want to say thanks to Vera and Alexander Draga family, who accepted Zlata as their child, cared and worried about her. You have become so close to us. Blessings to this big and friendly family! I want to express my gratitude to those families who help us in such difficult times. Thanks to you, our children believe in miracles and that dreams come true!!! We are foster family of refugees from Alchevsk. We have 8 children. We are grateful to God for the opportunity to take part in the excellent "Family to Family" program for children affected by the military actions on the East of Ukraine. Birthday of our Savior is the most wonderful time of the year! In America people prepare for Christmas in advance: buy gifts, decorate houses and streets. Even before the trip of our children to Charlotte, we were grateful to the host families and everyone who organized such a fabulous trip. When I called the host family "amazing" the mother of this family replied, "No, we are ordinary." The Lord really makes us awesome! He gives us support; He puts the desire to treat our children with love and care in the hearts of American families! We thank you that you have opened your hearts, your homes to our children! On the way home, when were on the train to Slaviansk, Andrew was sad, he had tears in his eyes ... These tears touched my heart ... These are tears for the Aksenov family, a family that has become so close to him! I know that every child from this group had such a sad moment ... This is a pleasant sadness ... It is better to miss your friends than to be upset about the war. Our blessed organizers of the program "Family to Family", your work is important for us! Continue to help children to find friends in America and continue to give joy to children who have suffered during the war! We bless you and love you! Our precious families in Charlotte, you have given our children your time, your friendship, your resources and your heart! You have filled the life of our children with a fairy tale and paid for this unforgettable journey! God bless your families and your homes! Special thanks for the gifts! You have filled our children s bags with snacks, clothes and shoes they needed! On behalf of all parents THANK YOU VERY MUCH! My name is Liza Bondarenko, I live in the Luhansk region, so I know what war is firsthand… This year I was invited to go for social rehabilitation in Asheville, North Carolina through “Family to Family” program. There were 9 children in the group. Everyone has lived in Charlotte, and my host family lives in Asheville. My American family has been living in the USA for almost 30 years. They also have two teenage girls. I did not know what family I will live with until I met them. But when I saw them, I realized that I am very lucky. This family is great! I could only dream of such! They live very friendly. They always serve someone. The girls accepted me as their own sister and told everyone that I was their sister. I have never experienced such love, acceptance and care from people whom I see for the first time in my life!!! The church is also wonderful and all people are very friendly! The youth accepted me very well and we became friends. When I left for home, they cried and still write to me every day! It was the best month in my life! We went to the parks, to the cinema, to the ice rink, on an excursion to the Biltmore Estate, to the Billy Graham Library, to the mountains. It was all very nice, but the atmosphere with these people was unforgettable. God has made my childhood dream to celebrate a real Christmas come true. Since my childhood, I believed that the real Christmas atmosphere is in America. In general, I can describe all my feelings for a long time, but I know one thing: this is a miracle from God! God has showed me once again how great He is and that there is NOTHING impossible for Him!!! I am grateful to the program "Family to Family". I hope to meet my friends again!!! I thank God and all the people who helped this fairytale come true. I realize that I would never have achieved this on my own. Now I have the second family! I am very grateful to you and appreciate everything you have done for me! May the Lord bless your family! Love you and really miss you! With the support of our friends from the United States, Global Christian Support ministry continues helping widows whose husbands died defending Ukraine. In December, with God s help, we were able to provide support for the widow Marina Borodulina. Our volunteer, chaplain Dmitry, was acquainted with the fallen warrior Alexander Borodulin. They met at the war in June 2015 in the village of Shyrokyne, near Mariupol, where Alexander served in the Donbas service center. In August 2015, they met again. However, in October, when the chaplain came to the soldiers on the front line, he learned the sad news ... Sasha died ... Under unknown circumstances … He was only 33. A terrible grief, loss of a husband, father, son ... It is hard to imagine this pain. After this tragedy, chaplain Dmitry constantly spiritually supports his family: the widow Marina and her son, and the mother of Alexander. The family lives in Smila, Cherkasy region. Due to support of American families, we were able to buy fuel for their house with stove heating, this help is so important to them, they are grateful for such a Christmas gift. Marina told us about their life, now it is divided into "before" and "after." Before the war, Sasha was a worker at Shevchenkovo ​​station, a repairman-inspector of freight cars. He worked there for more than 10 years. Alexander was very kind and responsive, loving husband, good father ... At that time his son was only 4 years old. The boy waited for his dad to return, he told that he had a dream about his father and he said that he loved and would always protect him. “He didn’t live long, he died so young ... After his death, I realized that every day could be the last, I began to appreciate what I have and thank God for everything,” - the widow told with tears. Alexander s mother worked on a farm before retirement. Sasha was her only son. It is very hard for her to go through the loss of her son ... At the end of our meeting, the widow Marina expressed her gratitude to the people who did not remain indifferent to her pain and provided such significant support. From the bottom of our hearts we thank our friends from the USA - Pavenko Sergey and Valetina, and also Kirichenko Alexey and Alina for their support to widows and their children. May the Lord bless you and your families and cover all your needs! The Bible says that widows and orphans will always be near us, and that pure religion and undefiled before our God is to visit the fatherless and widows in their affliction. With the support of our friends from the USA, Global Christian Support ministry continues to serve the widows. This time we have visited the widow Yulia Bukharova, in whose family a tragedy has happened quite recently. The Bukharov family lived well, Yulia and her husband Sergey worked, provided for the family and raised 4 children (Alena - 14 years old, Anton - 12 years old, Veronika - 5 years old, Nastya - 3 years old). But on October 22, 2018, while Mom was at work, Sergey and two younger daughters fell asleep in the house, but that night there was a gas leak. As a result ... all of them died ... This terrible grief has happened quite recently and Yulia is unlikely to ever be able to talk about it without pain and tears ... After our first meeting and pleasant communication, Yulia and her mother Tatiana, said that they felt peace and comfort in their hearts. Now Yulia with two children live in the house of the grandmother. Chaplain Dmitriy Martiyan invited them to church so that they could choose humanitarian aid as clothes and shoes for the children. They were very grateful. And, of course, it was a good opportunity to invite them to church for worship. Now the family is going through difficult times: these two children needed warm shoes for the winter season more than ever. And thanks to the caring families from America, who sent financial support for this family, we were able to buy shoes for Anton and Alena. Seeing that this helps them to realize that they are not alone in their trouble is very valuable! From the bottom of our hearts we thank our friends from America - the Pavenko family of Sergey and Valentina and Alexei and Alina Kirichenko for financial support for the widows and their children. God bless you! Huge thanks to the people who help the orphans and widows! Three churches were attacked in Sri Lanka, with explosions killing dozens of Christians as they celebrated Easter Sunday morning. Three hotels — Shangri-La Colombo, Kingsbury Hotel in Colombo and the Cinnamon Grand Colombo&n.. The Notre Dame Cathedral, a major church that has long been an enduring iconic symbol of Paris, France, has experienced a severe fire that has caused heavy damage. 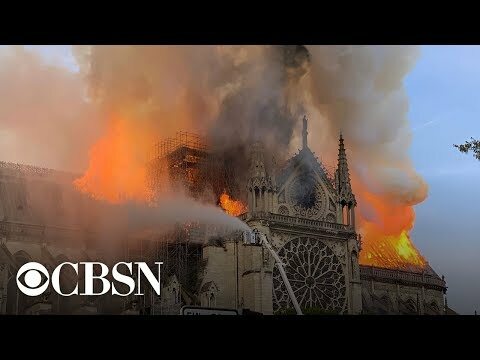 Fire broke out Monday evening in Paris at the historic church, with the spire of the l.. Looking for: 30 - 43 Age. Муж Божий,которому глава Христос,семейный,заботливый,щедрый,с чувством юмора,любит детей,отдых с семьёй,путешествие,активный отдых,спорт,развитие во всех направлениях,музыку,животных,гостиприймный,служение в церкви или на ниве Божьей!. Looking for: ищу человека, желающего проспонсировать совместный проект. Его финансовые вложения и мои умственные и физические. Я готова трудиться более 12 часов в сутки. Благодарю..
A new religious war has started in America and WA state, declared by the “Nones.” The “Nones” (people with No Religious Affiliation), having grown in size and passion the past two decades, and after recently conquerin.. When I had struggled with my faith, it was not in the area of science. I believed that science and faith can coexist, and I still do. The God who gave the special revelation of the Bible is also the same God who created the heavens and the earth from..